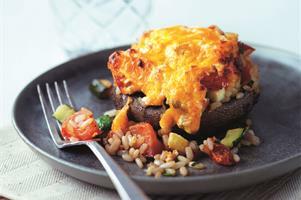 This portobello mushroom bake makes a tasty midweek meal. It’s vegetarian, though meat-eaters will love it too! Cook the rice in lightly salted boiling water for 12 minutes, according to pack instructions. Put the mushrooms, gills facing up, into a roasting tin. Chop the stalks. Heat the olive oil in a large frying pan and cook the red onion or spring onions and courgette for 3-4 minutes. Add the tomatoes, chopped mushroom stalks and herbs and cook for another 1-2 minutes. Drain the rice thoroughly and stir it into the vegetable mixture. Season with salt and pepper, then spoon into the mushrooms. Mix together the Greek yogurt and cheese, then spoon it on top of the rice mixture. Transfer to the oven and bake for 25-30 minutes, until golden brown. Cook’s tip: Authentic Greek yoghurt works best in this dish, as it’s really thick and creamy.